How do you toast coconut? THIS WAY! This is the easiest way to make toasted coconut for ANY recipe. I even have a video demonstrating how to make toasted coconut! Have you ever made a recipe where one of the ingredients is “toasted coconut” and you’re confused because you don’t know how to toast coconut? Or, have you ever attempted to make toasted coconut to garnish or add to a recipe and it burned and smelled your whole house up for three days? Yeah, I’ve been there. BOTH of them. More than once! That’s why I’m kicking off my Cooking Basics series with a simple and easy way for how to toast coconut. This is one of those posts that you should just pin and file away for a rainy day, especially with it being spring and Easter season. Coconut abounds this time of year and adding toasted coconut to any recipe (sweet or savory) is the perfect way to kick it up a notch. It’s the perfect garnish for a Coconut Carrot Cake, Banana Pancakes, or to add on top of Triple Coconut Cupcakes. It’s also good on savory recipes, like on top of green beans, tacos, or soup. Toasted coconut adds the perfect crunch to so many recipes…and I even like to sprinkle it on my yogurt or cereal in the mornings. Use a frying pan on the stove instead of baking it in the oven. It’s easier to watch and keep it moving this way. Use medium-low or low heat to cook it. Stir almost constantly until it begins to brown. Do not walk away from the stove; coconut goes from brown to burned very quickly. Make sure to stir the sides of the pan and keep it turning from the bottom so it toasts evenly. Once it’s brown, immediately remove it from the heat and the hot pan to cool completely. How Do You Toast Coconut? Like this…the easy way! How do you toast coconut? This easy way! Doing it on the stovetop lets you control the heat and keep it moving, which is essential to keep it from burning. 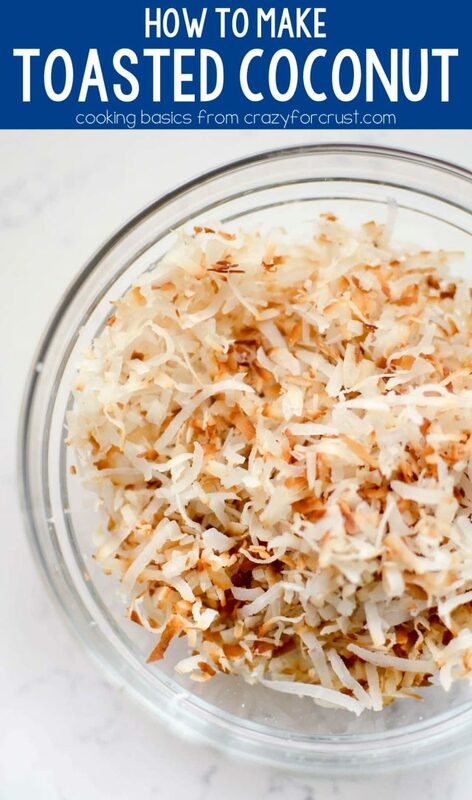 With this easy recipe you'll have toasted coconut for every recipe! Place a small frying pan over medium-low heat. Add the coconut and break up any chunks using a wooden spoon. Cook, stirring almost constantly, until the coconut begins to steam and brown. Turn the heat to low and continue stirring constantly as the coconut browns. Do not walk away - it will go from brown to burned very fast. As soon as the coconut is browned to your liking, immediately remove pan from heat and remove the coconut from the hot pan to a bowl or plate to cool. Use as desired for garnish. Store in an airtight bag or container in the refrigerator for up to 2 weeks. Click here to see my ULTIMATE COCONUT recipes! Toasted coconut butter – can you imagine that on your morning toast?! Toasted coconut shortbread cookies – Hello, perfect holiday cookies! Toasted coconut white chocolate fudge – Is this not the perfect food gift for the holidays?? I am SO making this. Buying coconut chips are crazy expensive. This only requires one ingredient and it’s so easy! I love the “do not walk away from the stove” tip. That is true for so many things and yet you’ll only be gone for a second…oops! I love toasted coconut but I can not stand the smell of coconut cooking in the oven. I would have never thought of toasting this way and it just makes sense. THANK YOU, THANK YOU, THANK YOU for this tip. Burnt and stinks for 3 days…yep been there! Did this yesterday for a pie! Except my recipe should say” go ahead and burn the first batch, wipe pan, watch second batch very carefully, moving with spatula constantly!! !” I seem to do this every time! Love your blog, Dorothy. I wish I had look at this yesterday. I tried to bake it and had an oven fire.